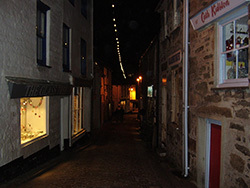 St Ives has a wealth of shops of all sorts. The main shopping areas are Tregenna Hill, Tregenna Place, St Andrews Street, Fore Street and Wharf Road. Many of these, not surprisingly, sell local arts and crafts. There are quite a few gift shops as well. We have a book shop on Fore Street that sells a variety of fiction, non-fiction, local guides and maps. There are also a number of specialist food shops around town. There are three pharmacies - two Boots stores plus Leddra's on Fore Street. 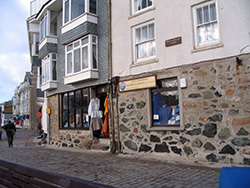 For everyday items there are three Co-Operative stores - on Tregenna Place, Royal Square and The Stennack. 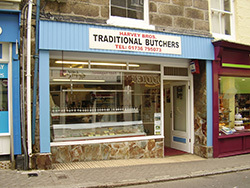 A traditional family run butchers shop on Tregenna Place. They supply high quality local meats and delicatessen products. This includes pork, lamb, chicken, duck, sausages, burgers, bacon, gammon, offal and game in season. Also beef from their own farm near St Ives. Their website has more details and you can buy meat online. The Co-op is situated on The Wharf where it has been established since 1920. The Society has traditionally traded in protective clothing for fishermen and for those who work in the natural elements. The manufacture of such items has come a long way since The Society first stocked oilskins and leather sea boots. Therefore today the waterproofs are light weight and breathable and modern footwear is stocked for the outdoor enthusiast. They stock angling gear and bait. There is also a range of other items including chronometers, barometers, compasses, knives and multitools. 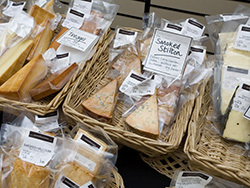 A weekly market - every Thursday - at St Ives Guildhall. Selling fresh local produce of all sorts. 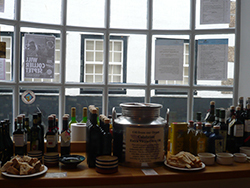 This includes fresh vegetables, bread, cakes, fresh fish, meats, Cornish cheeses, preserves, honey, sauces and much more. Everything on sale is grown or produced in the local area. There is a great variety of produce that changes week by week depending on the season and what is available. Their website has more information.